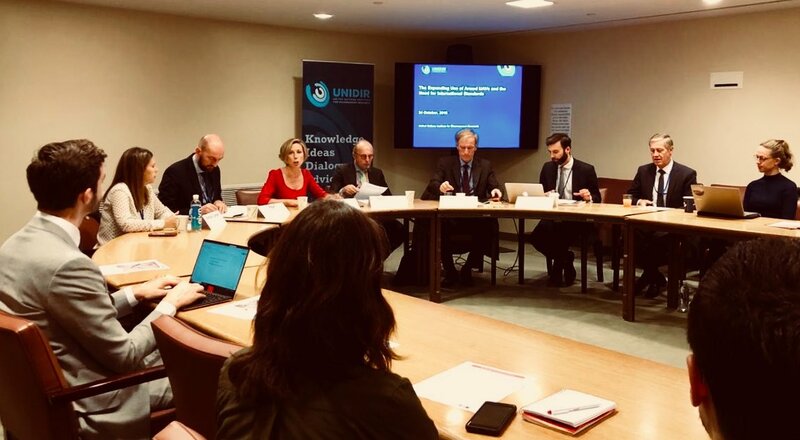 In the morning of the 24st of October 2018, EFAD members PAX and Stimson Center co-hosted a well-attended side event at the UN First Committee together with UNIDIR and the German and Dutch UN Disarmament ambassadors, to discuss the expanding use and proliferation of armed drones. The discussion was opened by UNIDIR’s Director Renata Dwan. Together with diplomats and national representatives, the panel – Rachel Stohl (Stimson), Wim Zwijnenburg (PAX), and George Woodhams (UNIDIR), the Dutch ambassador of Disarmament Robbert Gabriëlse and the German ambassador Peter Beerwerth – discussed what next steps should be undertaken by the international community. The panel highlighted worrisome signals of a growing interest in building cheap and easy-to-deploy military drones, as well as the legal and regulatory framework in which the increased use of armed drones by state and non-state actors should be understood. UNIDIR launched their new research paper Weapons of choice? that is focusing on the expanding development transfer and use of armed UAVs. Because new technologies are developing very quickly, it is of utmost important to develop common standards, or at least common understandings, of how unmanned aerial vehicles should be used and what limits on such use should be in place. States should engage in inclusive multilateral dialogue, and publicly pronounce their views on how armed drones should and should not be used. Apart from the call for states to express their views on what the limits should be, the panel also stressed the importance of ensuring compliance with already existing international law. In a newly launched report, titled Human Rights and Human Realities, PAX showed the local perspectives on drone strikes through interviews with civilian victims of the lethal force of drone strikes. Victims who seek justice, access to information, and retribution find themselves in a legal labyrinth, rarely making any progress, mainly due to the State’s lack of transparency on the policies that informed drone strikes. If these practices are left unchallenged, they could set an alarming precedent for other state and non-state actors to follow. This concern was reiterated by the other panelists, which indicated that as drones proliferate the number of such violations might increase. The current debate on controlling the use of armed drones is focused on the export of armed drones, but it has several gaps. The US-led Joint Declaration for the Export and Subsequent Use of Armed or Strike-Enabled Unmanned Aerial Vehicles (UAVs) only covers the use of drones which were exported, not those developed domestically. However, another recent report by PAX titled Unmanned Ambitions explained how an increasing number of states are growing domestic production capabilities for financial and security reasons. Moreover, many states are acquiring drones which are unarmed but could potentially be armed in the future. It is of utmost important to discuss what these developments mean for the international stability. Do we need to develop more processes and procedures to better control, regulate or establish international standards for drone proliferation and use? Or are the current tools sufficient? Stimson added to this debate with an analysis of how the ATT is applicable to armed drones export controls and looked ahead on what is needed to ensure strong international standards on the use of armed drones. In the discussion, the panel elaborated on whether strengthening or more fully implementing the current control regimes would sufficiently address the above mentioned concerns. Relevant stakeholders, including States, civil society, and the industry, should answer these questions by considering what characteristics of drones make them particularly unique for pursuing (new) standards and norms to guide the use and transfer of armed drones. Questions from the audience indicated that there was also a need to keep a focus on the disputed use of drone strikes and ensure a strong pushback against those who threaten to undermine this with loose interpretations of legal principles. A beginning of such an informed discussion was set with this side event, and will hopefully be continued in the future.